Cynthia Arrieu-King is associate professor of creative writing at Stockton University and a former Kundiman fellow. 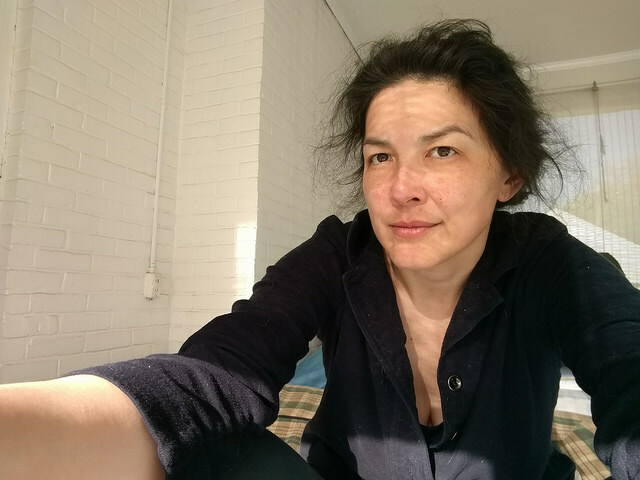 Her books include People are Tiny in Paintings of China (Octopus 2010) and Manifest, selected for the Gatewood Prize by Harryette Mullen (Switchback Books 2013). Her poetry book Futureless Languages (Radiator Press 2018) and Continuity (Octopus 2019) form a kind of double album about inherited war trauma and family lineages. She lives in the East Coast Megalopolis. What questions or obsessions urged this particular work into being or revealed themselves in it? Four years ago, I had stumbled across and put in an elegy the linguistic idea of futureless languages. The phrase refers to the fact that some languages rather than use a future tense that’s carried in the verb conjugation, use the present tense and a time marker for the future. So they say tomorrow it rains. Tomorrow I am old. So they have the future tense, but it is so called “futureless”. A researcher did an immense study of how people who spoke futureless languages lived and it seems those speakers did not think of the future as far off because it literally is said in the present tense. My friend Hillary Gravendyk had lived with serious illness for many years. So the idea of grammatically futureless languages belonged in an elegy for her: It covered the idea of living for today but also without thinking of the future as something far off or abstract. She had to live with an empty space rather than potentials. Or the hope of them. I think she had thoughts of what could be nevertheless, obviously. I also have been mulling over infertility, mourning the environment, and the practice of translation, all things that sort of face either an ending or a major transformation in which something is lost. Also, how we get Englished by reading English literature even if we aren’t English at all. My writing has always been about seeing things as accurately as possible and these subjects all offer some way of understanding what might be going through a catastrophic sea change or rebirth. That has no future as we had imagined it, only as an unimaginable place. “Form sets the thought free,” says Anne Carson, and I believe her. How did form and thought co-evolve in the unfolding of this work? I really wanted a clear conversational sentence that, being collaged in a non-linear way with other ones, could vibrate with associative leaps and a lot of pleasure of language. I think I really approached my lineation thinking about highlighting human voice at the same time that I let language sound really strange. The ideas of freedom and also being uncertain often meant a long line that can stop short suddenly, make and then break the pattern. What’s the relationship between the speaker’s “I” and you, yourself? How is the book’s “I” informed by your I and/or eye? My friend the wonderful poet Jesseca Cornelson said she thinks the most important word in my poems is “actual” and that I am ekeing out a kind of faith that is not at all fainthearted. That made me happy. I would say my speaker is a constructed me, not a persona or an exploration of an abstracted voice. What felt riskiest to you about this work? I articulate some critique and violent imaginings that stem from the general global, environmental anxiety. But also think about what matters in daily life, how to wait, how to accept, how to still enjoy. The book also talks about infertility, a subject so personal and angst ridden for me. I felt a lot of reluctance to leave the house, to socialize, to be on the street with kids for years after I tried to have a biological child, and so I needed to put some of that in poems. As a medium somewhere between time-based and static, poetry engages temporality in a fascinating range of ways. How does time operate inside this work and across the experience it creates? So Futureless Languages meditates on the future, the future we witness through another culture’s aftermath of genocide, through the writing on the wall and the feeling of being at the end of something and trying to imagine the future. My spring book Continuity addresses violence in the past and through family and siblings, and visions of the future. I think of the two books as a double album working together to let the past, the present, and the future intermingle and collage rather than be chronological. So rather than flat memory we can see what contrasts, meanings, and evaporating images each makes in conjunction with the other two. Time is very much subject, emblem, enemy, and mode, It’s the water all around and what shades in people’s character, their learning, virtue or lack of it, their forgetting, their willingness to truly see. We scarely address our genocides as a culture here in the USA though I somehow was educated about them in grade school. I got very obsessed with how Germany dealt with the psychological aftermath of the Holocaust. How they express violence in their art now or not, or how they want to emphasize the potential for evil in everyone, understandably. How Berlin is a city where a person like Ai Wei Wei takes refuge and how and why that happened. My friend the poet Leora Fridman told me she felt exoticized there as a Jewish person the way some people exoticize Native Americans. We always sentimentalize those we oppress or oppressed, but what else is going on there? How did the book’s structure unveil itself to you? What emerged to shape its architecture? One step at a time, one move at a time, like a chess game. I often read and reread passages of the book or a newly written poem just before bed or before a nap. I often wake up from sleep with solutions and missing pieces that will make bridges to the other poems. It seems like there’s always a solution lurking and that’s an abundance I enjoy engaging with. What kept you company during the writing of this work? Did any books, songs, art works, philosophical treatises, snacks, walks, or oddball devotions contribute to a book-specific creative realm? I played some Stars of the Lid, looked at art by Sarah Walker and Sara Sze. Also reread “From the Republic of Conscience” by Seamus Heaney a few times, and revisited Alice Notley, Mei-Mei Berssenbrugge. I owe a lot to Iceland where I learned a unique history, felt in love with the landscape and nature of the people I met, and also felt shockingly safe. It gave me a love of not only their language but other languages and cultures, and a reminder of how very big the world is. As for oddball devotions, I fell into a jag of German movies and TV that kind of went from Maren Ade’s Alle Anderen (Everyone Else) and Toni Erdmann to watching Lars Eidinger in Ostermeier’s German Shakespeare productions, pieces of Hamlet and all of Richard III. I watched many Eidinger performances: He seems preoccupied artistically with villainous roles and separately expressed that need many actors have for attention or approval. These two things seem related, wanting approval or attention or power and a capacity for evil and that gives me more to think about re an artist’s life maybe than a citizen’s. And I’m watching Dark, streaming internationally (on Netflix) which has a lot to do with generations, time, etc. That’s a whole other ball of wax but inspired me too. All these have to do with the oppression of the truth that everyone is aware of and what might happen if you have to deal with it. How has it been to shift out of the creative space of this book? What are you working on now? I’d say I have never written so much in so little time as this summer and it’s been satisfying to challenge myself to go deeply into an idea and book structuring. It’s also going to be nice not to think about WWII for a while. Or trying to purge griefs. I’m trying to wrap up my manuscript of creative non-fiction that I’ve been working on for several summers, the Betweens. It has made me literally ill a few times. It’s about race and sight and discernment and relating to people. I´ll probably make a sweater before that. Feeling in pain when there is no stomach ache. a sorrow not forthcoming but showing the leathering hand. The artist pours out this visible tension, scraps pouring through. things that stick, memorized coins, everything assembled. your language, English, he says, is too specific. Unpreventable. after persistence, shrewdness, we won’t have to really guess now. nation I could call home, though. Trained as I am. She said the most radical thing she ever did was stay put. So. A green ocean waves its hands into and out of view. Its million seeds off, it puts on a few thousand green shirts. Savors air. No one sees everything the tree has thrown away. Every time I watch the news I delete a few more poems. Lisa Olstein is the author of four poetry collections, most recently, Late Empire (Copper Canyon Press, 2017). Pain Studies, a book-length lyric essay exploring the intersection of pain, perception, and language is forthcoming from Bellevue Literary Press in 2020. Recipient of a Pushcart Prize, a Lannan Writing Residency, and fellowships from the Sustainable Arts Foundation, Massachusetts Cultural Council, and Centrum, she is a member of the poetry faculty at the University of Texas at Austin’s New Writers Project and Michener Center for Writers.